Royel Clark is a name that is synonymous with great gospel music. He is an accomplished veteran producer, singer, songwriter and promoter for the Christian music industry! He has written over 1,500 songs and produced projects for more than 175 singers and groups. Royel has hosted a number of radio shows across north Texas on KBEC, KNON and KSKY 660AM. 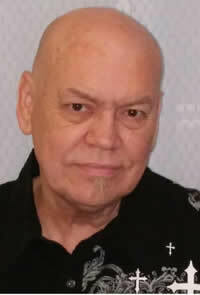 He produced and hosted The Songwriter's Corner television show for 16 years in the Dallas and Houston markets. He is the creator, producer and host of the nationally syndicated award-winning Texas Gospel Jamboree radio and stage show, The Oldies But Goodies Show and The Rainbowbuddy Gospel Hour with Samuel & Hollie Bushnell. In 1987, Royel was diagnosed with throat cancer. In the process of surgery to remove the cancer, his right vocal cord was infected and ultimately destroyed. After lasar surgery, the doctors said, for all practical purposes, that he would not sing again. As the doctors put it, "You just don't talk much less sing with only one active vocal cord." That's when Royel hit bottom. In September of 1988, as Royel put it, "I found Jesus Christ and accepted Him as my Lord and Savior along with my family." From that moment, his life changed! Today, Royel truly has a miracle voice from God. As he says today, "It's not the voice that I had, but it is the voice that God wants me to have, and I give Him all the praise and glory!" On October 21st, 2000, after 30 years of marriage, Royel's wife, Ruthie, went on home to be with Jesus. In spite of her failing health, she was always an encouragement. God knows our hearts and He knows just what we need. In May of 2002, God brought a wonderful woman into his life. Her name is Elaine. She knew that God had a plan for her life. After a year of getting to know one another, love took control and in May of 2003, Elaine became his wife. From that moment he knew that God had given him a second chance at love, life and marriage. Royel is the owner and operator of Anjel Music Recording Studies, recipient of the 2015 and 2016 Best of Mesquite Award in the Musical Arrangement & Production category. Whether you are a new Christian artist or a long time favorite, Royel offers commercial quality services at affordable prices! As a singer and minister, he brings a fresh approach to ministry in any church or venue. As a Master of Ceremonies, Royel offers humor and professionalism for any event! If you're looking for recording help, you want a singer to minister to small or large crowds, or you need an MC for your next ministry opportunity, seek the Lord and call Royel Clark!